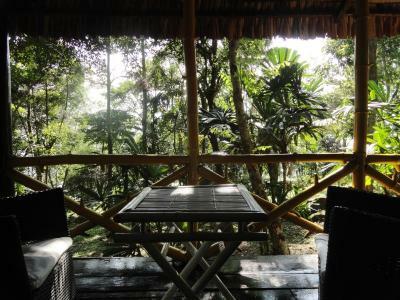 Lock in a great price for Bo Resort – rated 8.1 by recent guests! I and my friend spent few nights at this property and we couldnt be happier with our choice. 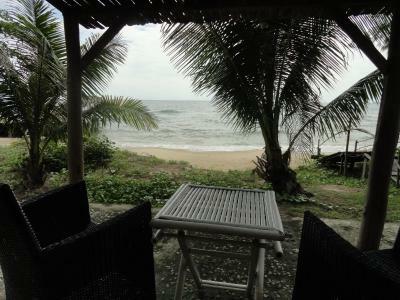 Beautiful calm resort, definitely unforgettable experience while staying in a bungaloe right on the beach. 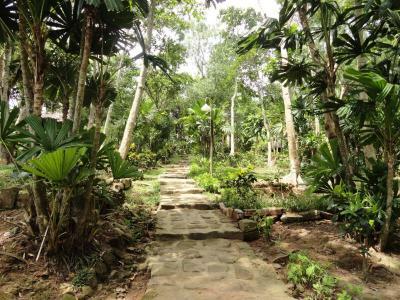 Resort is full of tropical plants and trees so you truly feel like in a jungle. Just you and the nature!! No need for luxury, this was exactly what we looked for. Plus kind staff and delicious food. Big thanks to BO Resort, hope to be back soon! I like the nature and relaxing atmostphere of the resort. It's quite and friendly. The place itself was super close, more like into the wild. 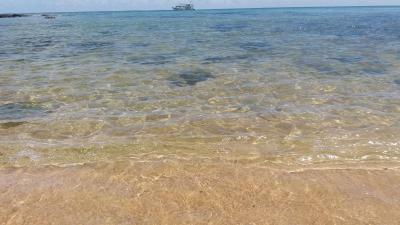 The beach by the resort was really great plus the chance to use it 24/7 was also wounderful. 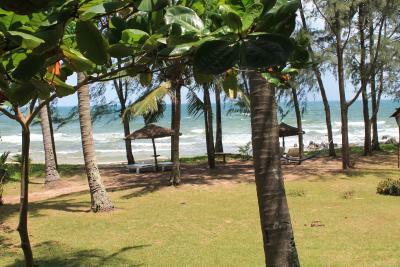 nice location, beach not as busy and dirty as closer to Duong Dong. good restaurants and bars close by towards the main road. still a good low-key option and well-kept in terms of cleanliness but starting to feel a bit faded and outdated considering the other options and value you can have at this point. Location, our cabin was virtually on the beach. Quiet and relaxing stay at the end of our holiday. 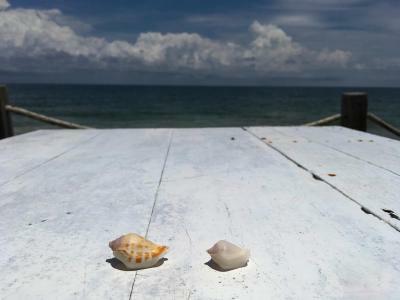 the food is delicious and the location is perfect for a quiet beach retreat! Definitely worth visiting if you are looking for something not touristy. 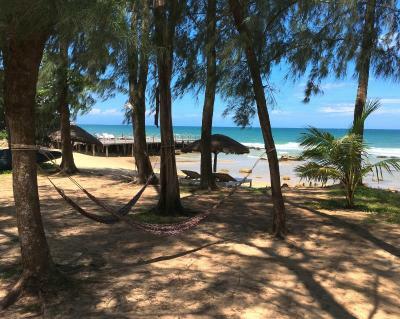 We even rented mopeds and drove around to other beaches on the island, but considering the more secluded vibe of Bo Resort, we kept coming back and spending most of our time on their beach. It was great to be able to have breakfast and jump straight in the water. What we also appreciated was the shade provided by the trees, which isn't the case in other beaches we visited...we were able to tan when we wanted to and find retreat in the shade when it got too hot. 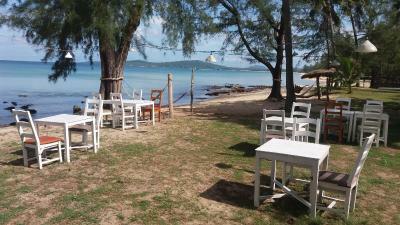 The only great thing about this place is the location - you can enjoy your meal sitting almost in the beach sand. It was beautiful bungalow without a/c and glasses. There was cooler on the ceiling and mosquito net around bed. It was beautiful fresh air and it never was hot or stuffy. 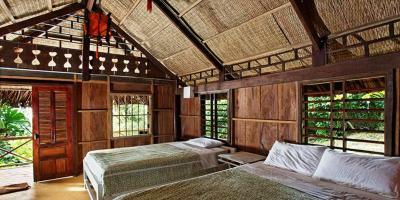 Bungalows are located not intimately so there was no noise from another guests. Currency exchange was very good. what was nice? the beach and the garden...thats it. 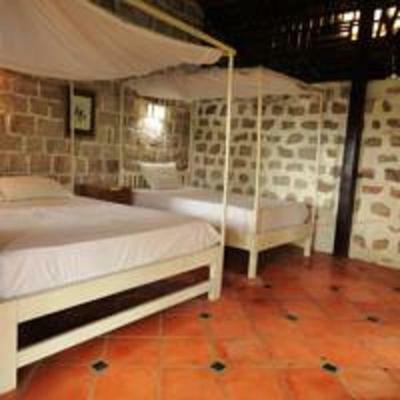 Bo Resort This rating is a reflection of how the property compares to the industry standard when it comes to price, facilities and services available. It's based on a self-evaluation by the property. Use this rating to help choose your stay! 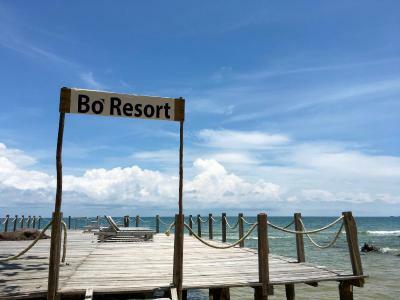 Set on a private beach area, Bo Resort offers a peaceful retreat in an eco-friendly property. It features standalone fan-cooled bungalows that overlook the garden or sea. Wi-Fi is free in public areas. Cozy bungalows have large windows that offer natural light. 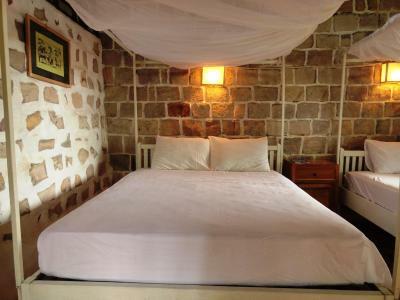 They are equipped with mosquito nets, a wardrobe and a private bathroom with ecological toiletries. 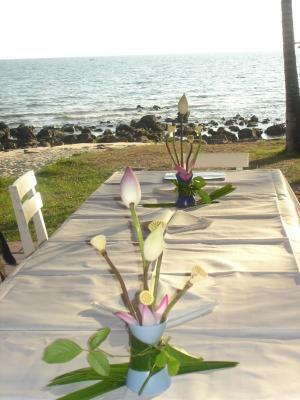 At the reception, guests can arrange for free snorkeling activities and a free 1-hour kayaking or canoeing trip. Local souvenirs are also available for sale. Day trips and transfer services can be arranged upon request. Available for all-day dining, the restaurant serves Western and Vietnamese dishes. Refreshing beverages can be enjoyed at the beach bar. Guests can enjoy a visit to nearby points of interest, including the famous Fish Sauce Factory, pepper farms and Cau Temple, approximately within 3.7 mi from Bo Resort. 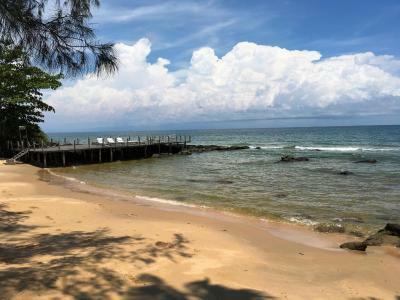 Resort Bo is a 40-minute drive from Phu Quoc Airport, which is a 55-minute flight from Ho Chi Minh City by a domestic airline. 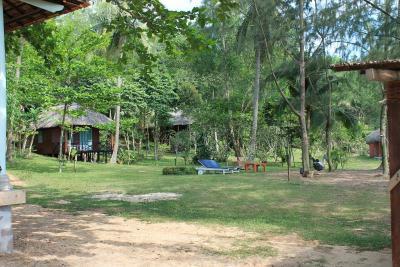 Ong Lang is a great choice for travelers interested in tropical weather, swimming pools and traditional food. 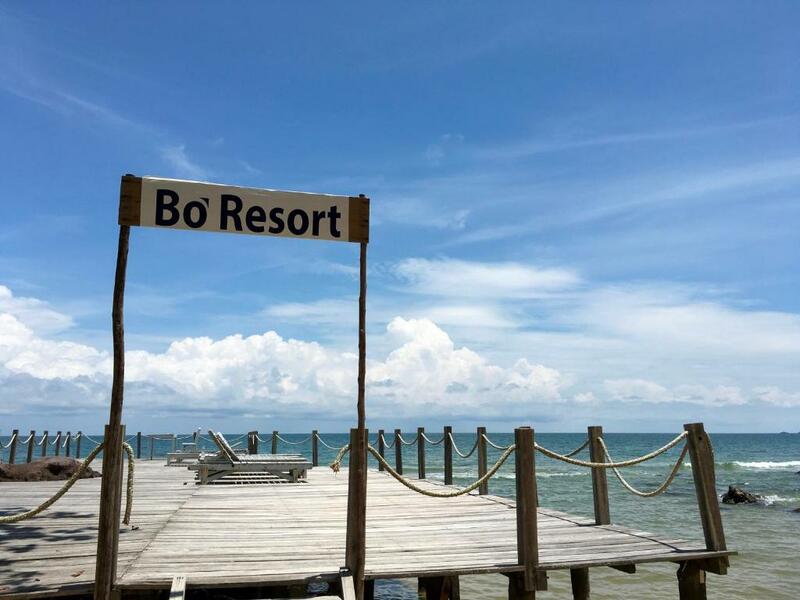 When would you like to stay at Bo Resort? 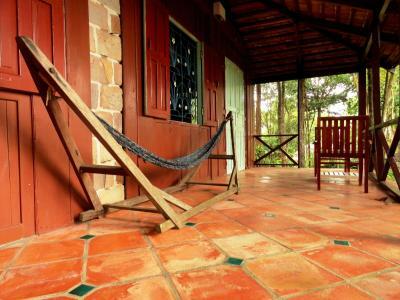 Overlooking the garden, this bungalow offers a fan and private bathroom. 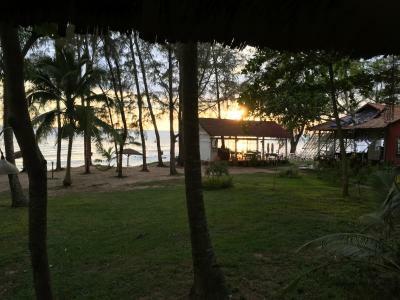 This beachfront bungalow offers a fan, private bathroom and views of the sea. 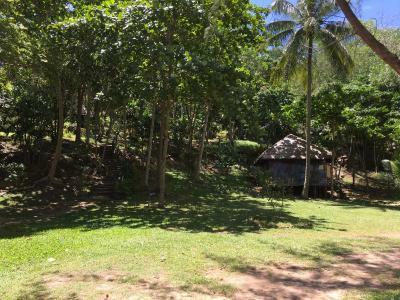 Offering additional living space, this bungalow for 2 adults and 1 child offers a fan and private bathroom. 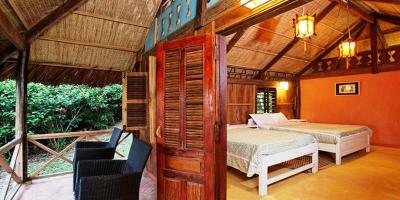 This beachfront bungalow for 2 adults and 1 child offers a fan, private bathroom and views of the sea. 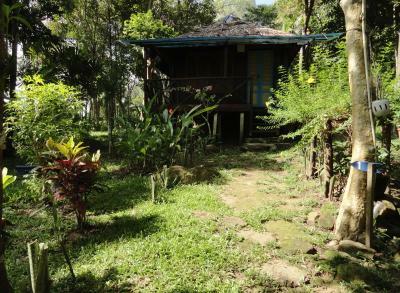 Spacious bungalow for 4 adults and 2 children offers a fan, 2 bathrooms and a private balcony that overlooks the garden. 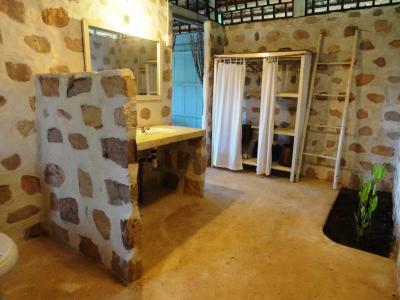 Bungalow has a desk, wardrobe and private bathroom with shower facilities. 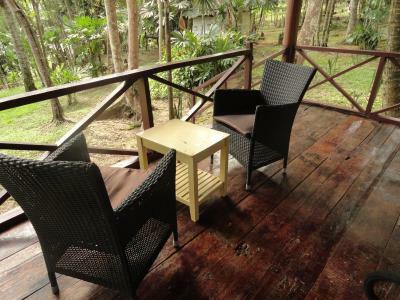 This bungalow has a balcony that opens out to sea views, a seating area and private bathroom. 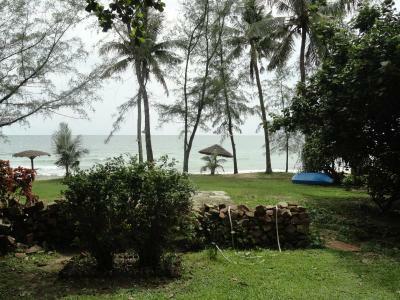 This beachfront, fan-cooled bungalow offers views of the garden and sea, and a private bathroom. This fan-cooled bungalow overlooks the garden and is fitted with a private bathroom. 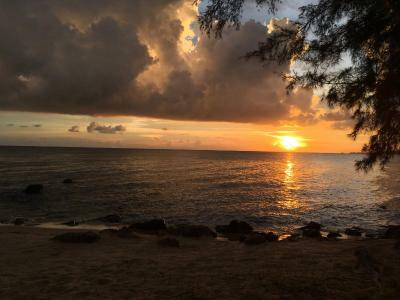 Area Info – This neighborhood is a great choice for travelers interested in tropical weather, swimming pools and traditional food – Check location Excellent location – show map Guests loved walking around the neighborhood! House Rules Bo Resort takes special requests – add in the next step! Bo Resort accepts these cards and reserves the right to temporarily hold an amount prior to arrival. Please note that as this is an environmentally-friendly property, rooms do not have a telephone, refrigerator, air conditioning or television. Please inform Bo Resort of your expected arrival time in advance. You can use the Special Requests box when booking, or contact the property directly using the contact details in your confirmation. Breakfasts were excellent as were evening meals. 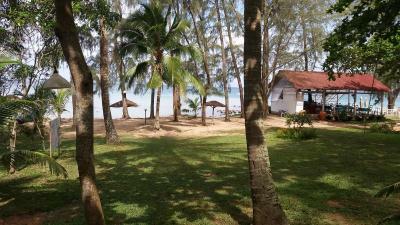 we chose this resort for quiet remote location but this does not really exist any longer on Phu Quoc. there was near constant noise from construction and boats. of course not the fault of the resort but something to be aware of. property scooters are in bad worn out shape. very long braking distance, steering not straight, ours had mirror and one light broken off and the tyres were worn down. of course we noticed after a short test ride and returned the scooter, but not before we slipped on the road and fell once. shouldn't have been given to us in the first place. Some Cabins a little tired and need attention, but comfortable. The food - my roommate had a food poisoning from the food served there. And the general quality and taste was not great. 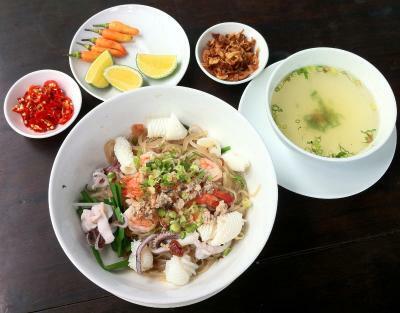 You can feel how the french owner has influenced the chefs work adding such ingredients to authentic Vietnamese food which Vietnamese themselves would never use. 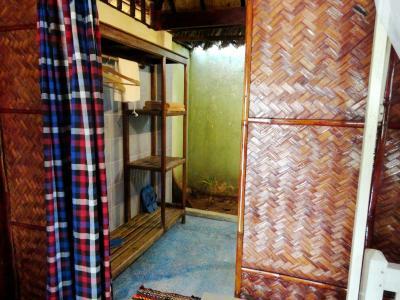 Also the bungalows need some freshening up to do and the stuff understands much less English than in anny other Vietnamese hotel. This was an absolutely fantastic place to stay. We had three wonderful days and nights at Bo Resort. Food: Amazing. Every meal we've ordered tasted delicious and was freshly made. It's a bit more expensive in comparison BUT you get it right at a private beach, so it's definitely worth it. (Btw it's not even more expensive than in town here - but it's not HCMC street food prices obviously). 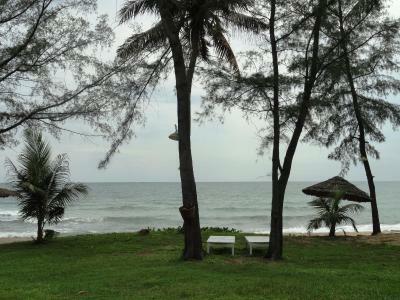 Accommodation: We stayed in a beautiful vietnamese beach bungalow surrounded by palm trees with ocean view. We had a king size comfy bed, a desk and a fan (which was honestly totally fine-no need for an AC really). The interior concept was beautiful and everything matched perfectly. 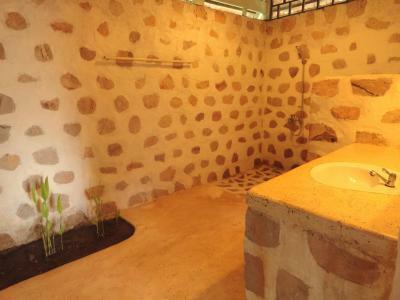 We also had a huge open bathroom space with a secluded toilet, a big shower (water pressure was just fine and the water wasn't hot but surely not too cold either), a wardrobe and many beautiful details such as a little plant patch. 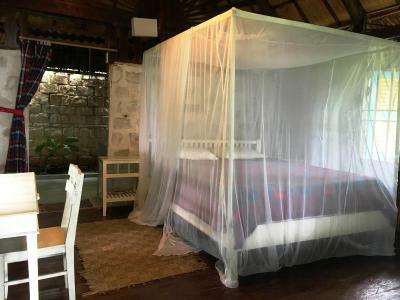 The mosquitos can be handled with the provided mosquitos net, the fan on full power and some mosquito spray. 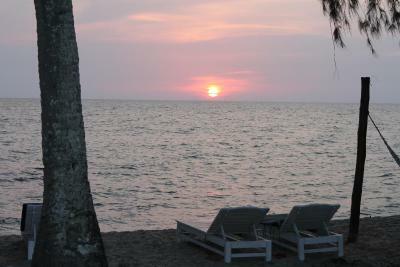 Beach: Bo Resort is located directly at a private beach. There's enough space and sun beds for everyone to still feel like you're enjoying this little paradise all by yourself. It's very tranquil and peaceful. And yes, there is some trash which was being picked up by the staff early in the morning but that isn't an issue of the resort but the ocean in general - so pick it up if you see any ;) Staff: The staff was throughout adorable, friendly, helpful, very attentive and able to speak and understand a fair amount of English. 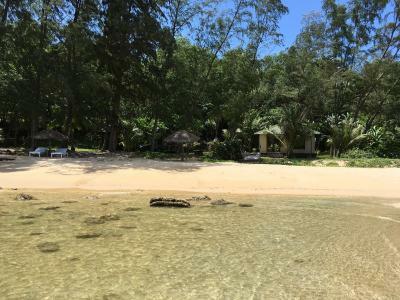 Location: The resort itself is secluded on a private beach and walking distance to some other hotels and restaurants at the beach. It's a 15 minute walk down to a small village where you'll find some great restaurants, cool bars, nice boutiques and some convenient stores. The bigger town and the night market are 8km away which equals a 5$ cab drive. what wasnt nice? well...where should i start... its way overpriced for what you get. the bungalows are very basic and not in a good or even reasonable shape anymore. everything is worn out and should be replaced long time ago. the mattress is hard and uncomfortable, the mosquito nets have holes, the water pressure for a shower is nearly not existing. and you only get hot water, if there was a sunny day. the included breakfast is a bad joke: 2 fried eggs and a baguette comes with a little tiny juice and a coffee. the prices at the bar or restaurant are way to high, compared to everything else around. talking with the manager didnt helped at all. the comment from the managment was: "if you dont like it, find yourself something else and talk to booking.com to get your money back. we wont help you with that." oh...and before i forget that point. they try to get hold of your passport the time you stay there. they dont wanna take a picture or a copy...they wanna keep it the time you are there. they say its the police that wanna check it from time to time. other resorts just check your passport while you check in...and then you get it back 1 minute later. just finding another accomodation wasnt a option, everything was fully booked during that time. 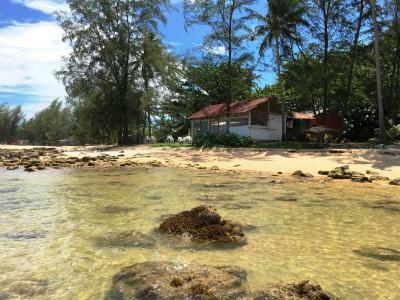 long story short: i dont have a problem with simple basic beach bungalows. 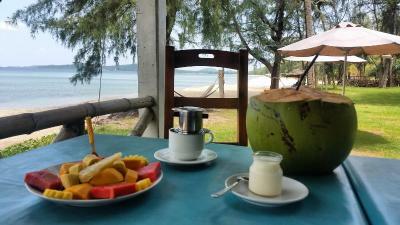 i travelled a lot in asia and this kind of resort cost usually something around 25$ a night...with a much better breakfast, and a good mosquito net. Solar shower didn't work, but it wasn't a major problem as weather was so warm. Some construction noise initially but the staff was really kind and moved us to a quieter cabin. 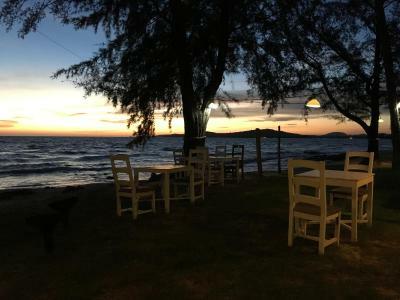 Restaurant was average (although amazing setting and great for sunset drinks), but there are plenty of nice places within short walking distance. 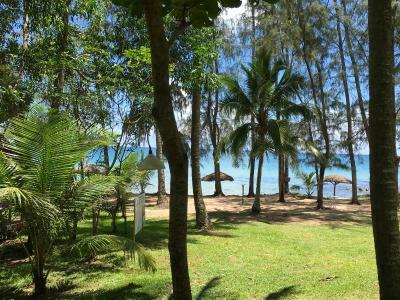 Spectacular setting on a beautiful, picture-postcard beach with soft sand and calm, warm, turquoise water. The cabins are rustic and basic, with no A/C, concrete or TV. For us that was absolutely perfect. 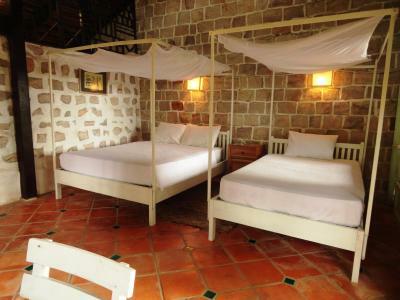 Beds are comfy and mosquito nets ensure you get a good night's sleep. 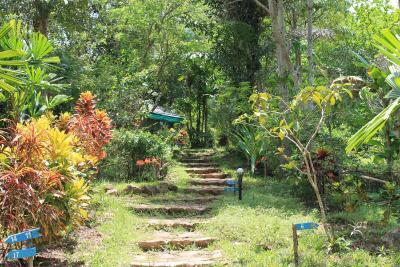 The gardens are stunning, alive with colours, sounds and tropical nature. This place is uniquely wild and nothing like the characterless resorts elsewhere on the island. Staff are really sweet and helpful. 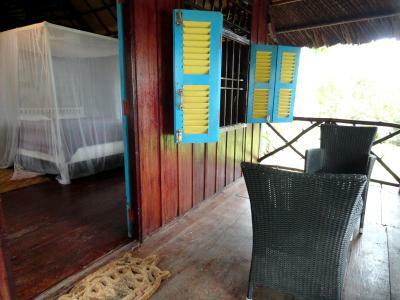 I can understand the concept of "ecological resort", but what is not acceptable is to charge 103 $ a night for a bungalow in BO "RESORT" in appalling conditions, without mosquito nets in the windows, without air conditioning, tv, refrigerator and without any comfort and most serious of all without hot water. We traveled with a baby of 1 year and had to shower her with cold water, this is unacceptable. The first night it was raining all night, the water came through the walls, the ceiling and fell to one of the beds. The next morning I went to tell this to the person in charge and owner of the accommodation and immediately offered us a bungalow to the beach much better than our bungalow. After a few minutes of this offer, the owner came to our bungalow and told me that he finally offered us the next door bungalow with the same features as ours. I told him that we'd like to move to the bungalow next to the beach and he said ok. 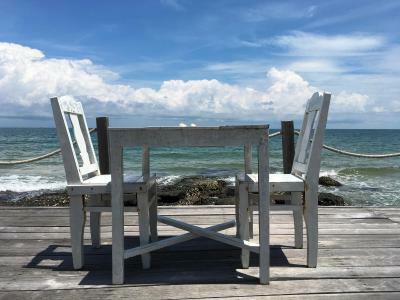 When we returned from our visit to the island, what is our surprise that they give us the key to the bungalow next door and not the one that he had been offered in the morning. After a big discussion, with the owner we went to dinner outside the establishment to not think more about what had happened. We could give many more details of our terrible stay in this establishment, but I think you can get an idea. 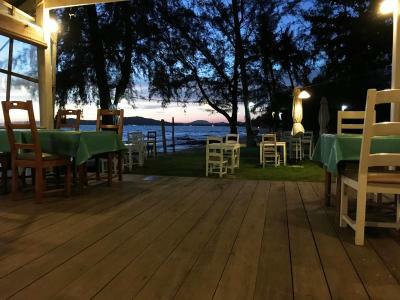 Our advice is that you never reserve in this establishment BO "RESORT" in Phu Quoc, if you do not want to throw away your money. I only wish to Bo Resort, thar NOBODY BOOK in their establishment. The only acceptable thing was the location, in the middle of a lot of vegetation, but the way to the reception is very complicated, with many steps very shelving, be careful!!!! I can say I dint like it...the area is beautiful and the garden is just charming. 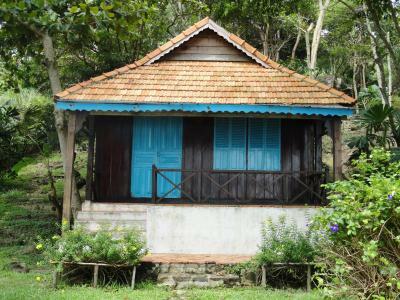 I liked how the bungaloves were simple, there is not much you need really. But it could have been more clean and as walls were not solid ( the roof is open on purpouse) we had a feeling that something was crawling from the darkeness whole night. Dont get me wrong. It was nice to be really in wild nature, but we didnt slept well because of it. So only for those who are more adventurous. The beach was just top. One of the nicest places in the area and super calm. Better than anywhere on the island. A lot of mosquitoes and other insects at night. Calm and nice bungalows in a garden right on the beach. The staff was helpful and the restaurant served good food. Good place for you who wants to chill out. 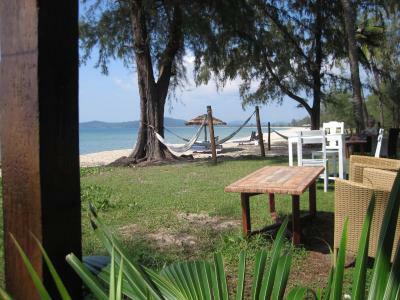 The location is great.And the beach is nice,quiet and clean.It is a very peaceful place.Very relaxing!